Avista provides teleprompter services throughout the West Coast. Our teleprompter technicians make staying on point easy. 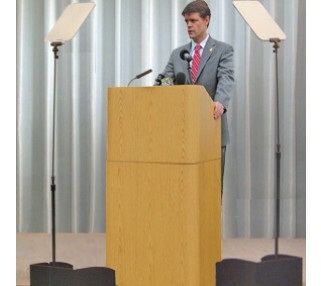 The White House has used this same "Presidential" style teleprompter model, so you know it's a quality, professional grade teleprompter. 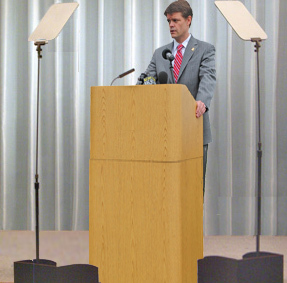 Teleprompters are being used more frequently by public speakers, because it frees them from worrying about memorizing their copy perfectly, or making a mistake or saying anything other than exactly what they intended. When every word is critical, get the support you need from great technology and professional teleprompter technicians. Avista will load your copy onto the teleprompter laptop and test run everything before your event for worry-free execution. The onsite technician will setup the hardware for optimal viewing and will control the flow of the presentation for you, based on your speaking speed. Font size and speed can be adjusted to your preferences for smooth delivery. Price shown is for teleprompter system only. Also requires Avista teleprompter technician at additional cost (which depends on length of meeting/event).